Speaking from the White House along side Palestinian President Mahmoud Abbas Wednesday, President Donald Trump called on Palestinian leaders to move away from violence in order to pivot toward a new peace deal. "There can be no lasting peace unless the Palestinian leaders speak in a unified voice against incitement to violence and hate. There's such hatred," Trump said. "All children of God must be taught to value and respect human life and condemn all of those who target the innocent." "Here at the White House, President Abbas signed a declaration of principles which laid the foundation for peace between the Israelis and Palestinians. The President, Mr. President, you signed your name to the first Israeli-Palestinian peace agreement. You remember that well, right?" Trump continued, referred to a peace agreement Abbas signed at the White House in 1993. "And I want to support you being the Palestinian leader who signs his name to the final and most important peace agreement that brings safety, stability to both peoples and to the region." 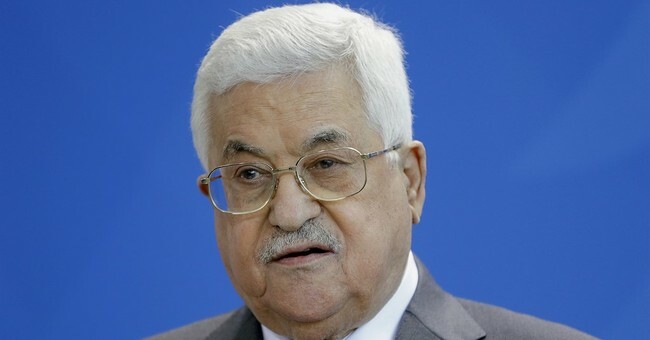 During his statement Abbas classified Israel as an occupier and demanded a two-state solution along 1967 borders, which would put the Jewish state in an indefensible position against enemies. "Mr. President, our strategic option, our strategic choice, is to bring about peace based on the vision of the two state. A Palestinian state with its capitol of East Jerusalem that lives in peace stability with the state of Israel based on the borders of 1967," Abbas said. "Mr. President, it's about time for Israel to end its occupation of our people and of our land." When Israeli Prime Minister Benjamin Netanyahu visited the White House in February, he agreed to a joint press conference with President Trump and took questions from a number of foreign and domestic reporters. Abbas did not take questions from the press during his visit.